As it's the New Year you can always expect a whole raft of movie remakes from Hollywoodland, but will a movie franchise reboot suffice for today? 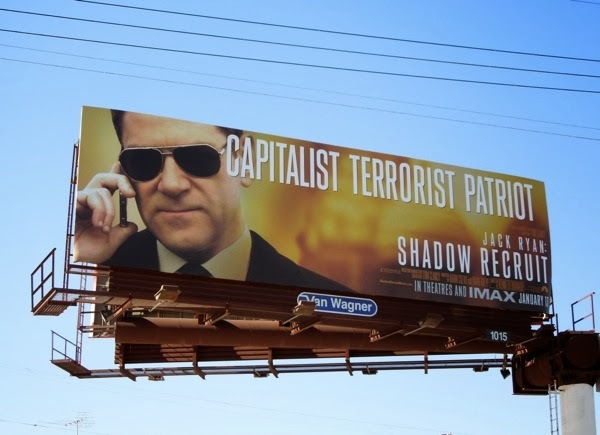 Tom Clancy's fictional character 'Jack Ryan' has enjoyed many incarnations on the big screen, from Alec Baldwin in 1990's The Hunt for Red October, to Harrison Ford in 1992's Patriot Games and 1994's Clear and Present Danger, and not to mention the aborted 2002 reboot starring Ben Affleck in The Sum of All Fears. 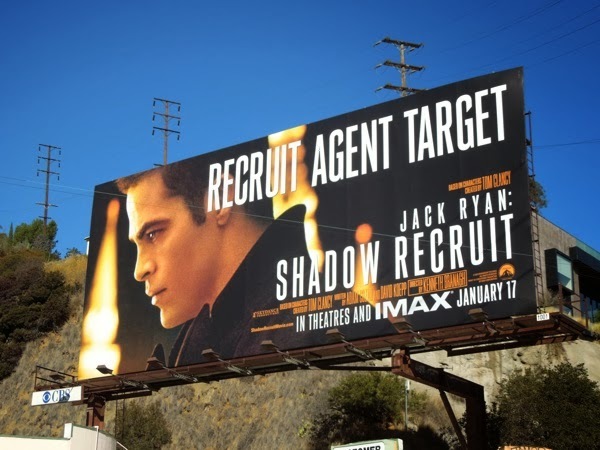 Over ten years since the last attempt to reinvigorate the CIA analyst, Chris Pine has been drafted in to fill the shoes and provide a younger face of the beloved character, obviously with hopes of kick-starting another money-making film franchise similar to the Bourne or Bond movies no doubt. 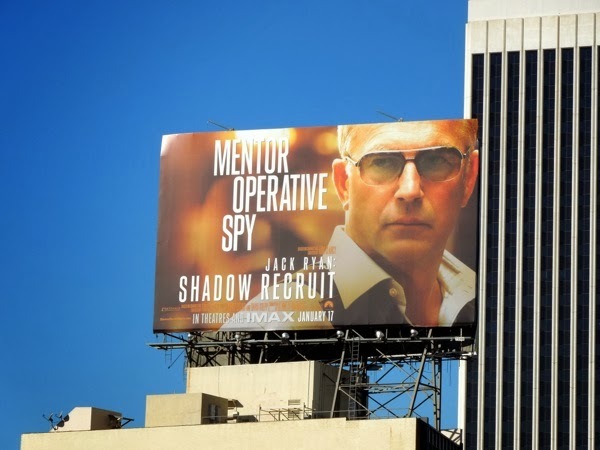 Can Kevin Costner and Keira Knightley help him reignite Jack Ryan in Shadow Recruit, as the inexperienced intelligence agency analyst uncovers a Russian plot to destabilise the global economy with a deadly terrorist attack. 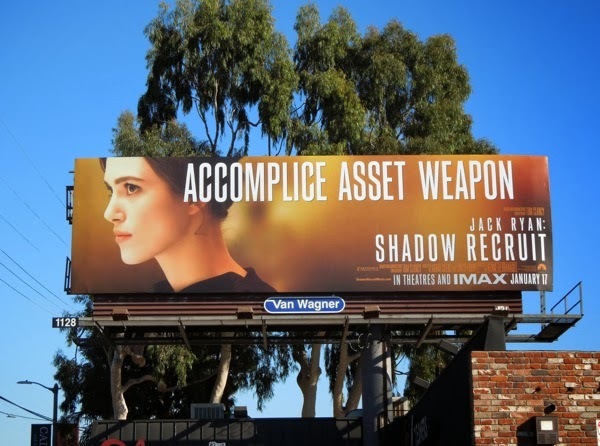 Kenneth Branagh has been tasked with breathing new life into this espionage franchise, and the British thespian even stars as Ryan's Russian adversary in this new action thriller which takes us right back to the beginning of Jack Ryan's covert career. 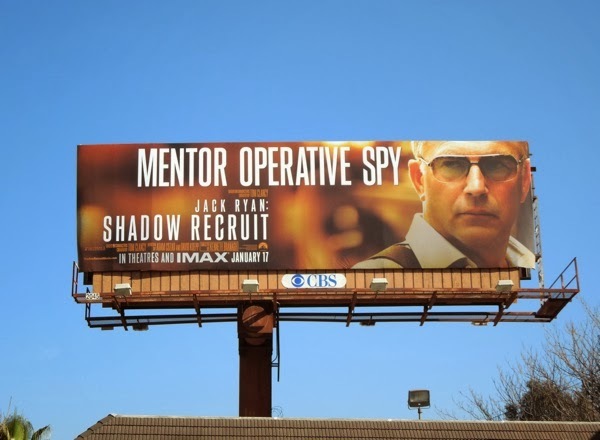 Interestingly the marketing team behind Jack Ryan: Shadow Recruit have opted for words rather than visuals to help convey the themes of the movie, which makes you wonder if Chris Pine on his own isn't enough to lure cinema goers into theatres. 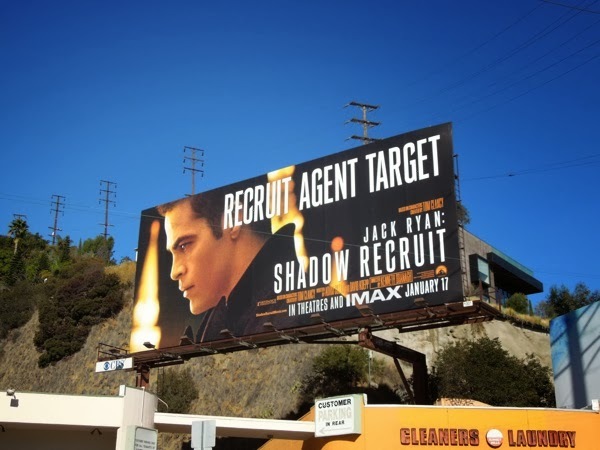 The 'Recruit Agent Target' billboard featuring Chris Pine was first spied along Sunset Boulevard on December 30, 2013, whilst the Kevin Costner 'Mentor Operative Spy' creative was spotted along Ventura Boulevard in Studio City on December 31, 2013 and also high above Wilshire Boulevard on January 14, 2014. 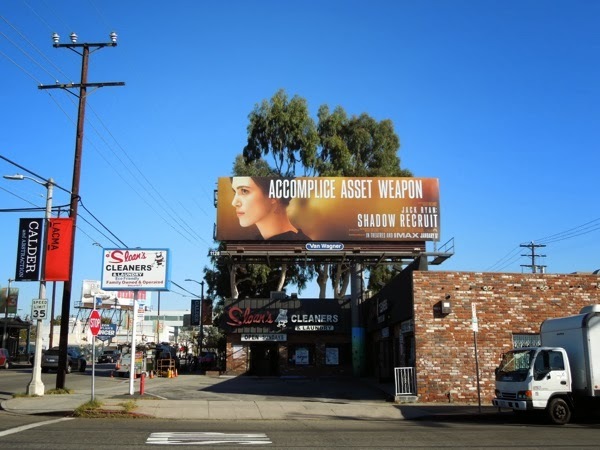 Meanwhile the striking Kiera Knightley 'Accomplice Asset Weapon' ad was snapped along 3rd Street on January 13 and Kenneth Branagh's 'Capitalist Terrorist Patriot' billboard was captured along Santa Monica Boulevard in West L.A. on January 15, 2014. 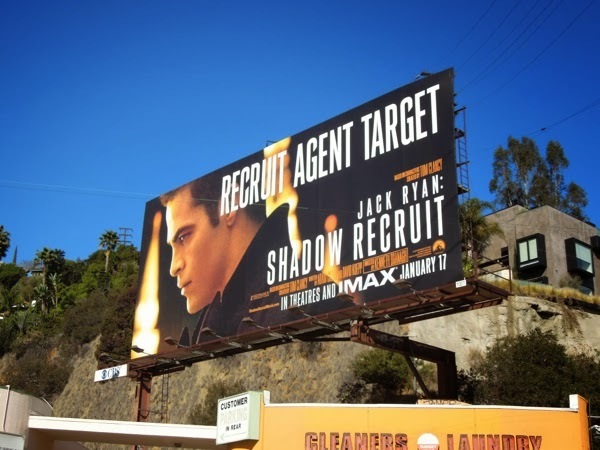 It seems like a funny time of year to reintroduce us to an action espionage property like this, so let's hope it's the shot in the arm that January needs at the box office. 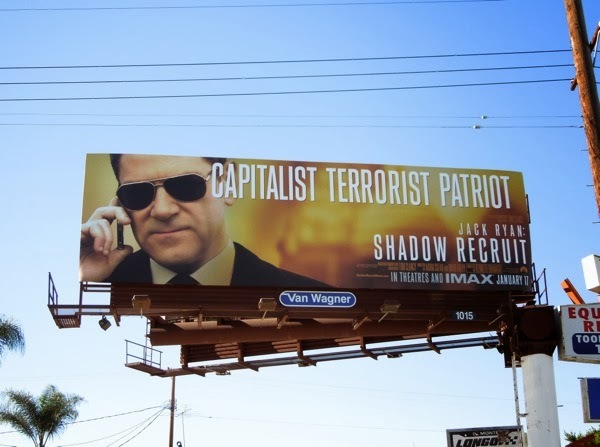 Bring on the master assassins, super spies and diabolical world-threatening plots.